Published on November 21, 2013 by Jennifer S.
After our final buffet breakfast, our luggage was loaded into the bus. 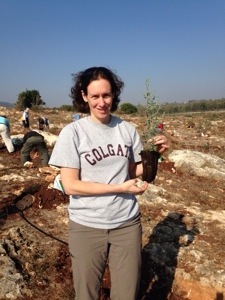 Before leaving Kibbutz Lavi, however we participated in a fabulous ritual, planting a tree. It is a gift for future generations, as we will not be able to enjoy them. Back on the bus, we headed south toward Tel Aviv. Along the way we passed Armageddon! 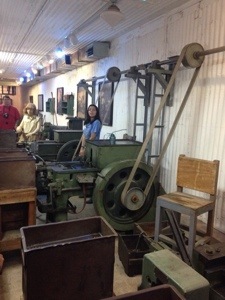 Our final museum visit of the trip was the Underground Amunition Factory, Machon Ayalon. Between 1945 and 1948, under a threat of being killed for making or possessing munitions, 46 kibbutz members secretly manufactured bullets for their cause. It’s a pretty nifty story. A boxed lunch was waiting for us in a room at the museum. After we ate, we shared our thoughts and feelings about the trip. There was laughter and tears, but that is as detailed as I will get. What happens in the bullet factory, stays in the bullet factory. We took one last group photo when we arrived in Tel Aviv and then had some time to relax. Dinner was at a nearby restaurant. Those continuing on to Petra ate and ran. After the rest of us finished our meal, we made our way to the airport. Most of us have cleared security, etc. and we are waiting to board. Can’t believe the week has come to an end!